I spend a lot of time in SL, a “social space,” alone. I am kind of an independent girl. I like to shop alone (because I like to get in and out); I blog alone (no one shining their facelamp on me); I live alone (no one else’s prims to clean up after). And I can have a BIG closet all to myself. I got this cute outfit out of my closet today to show you the skill that Nyte Caligari has. She has combined great system pieces with a brilliant sculpty on top AND an alpha layer around the torso that takes the mesh breasts out of the equation so the top fits everyone. Nyte has been in SL a long time and she has stayed up with the new design technologies that SL offered so she can make a kickin’ outfit like this and make it look easy. My skin is one of Apple May’s newest and I am very charmed. Her rosy cheeks are presumably the “doll like” part of this skin but they are not overwhelming. I love the gentle glow of the skin, the soft highlights on the lips and brow. Apple does not overdodge, which I see on a LOT of skins. Apple has improved her skins leaps and bounds and she is going to be placing herself in the top skins soon, based on this offering. No this is not about the political party–we won’t even go there. I have never been to an actual tea party but I was recently invited to one so I went. I was told to wear my best party frock. I put on this cute dress from Miko Omegamu. Miko is one of the original perfectionists of SL. Every system piece is just so, every prim is in its place—always. And her textures are amazing. In this beautiful dress, we see a gorgeous floral print on a body-conscious dress. Miko has managed to run the crossover line from the top into the skirt. Lining things up this precisely on system pieces is very difficult work but Miko makes it look easy. Then she runs the ribbon from the other side under as if it’s seen through the fabric. The top worn underneath can be seen under the print in back as well and a darker red ribbon runs along the hem on the skirt. It’s in all these little details that the marks of a great designer can be seen. The tea party was hosted by sachi Vixen, in honor of the release of her new skin Lauren. I showed the skin a couple days ago and I show here a version of the skin she gave out to tea party attendees and is now selling for a mere 150L for the next day or so at her sim. Go get it and then check out the other Lauren skins. I am wearing a new hair from Truth Hawks. He was smart enough to include optional bangs with this style, which makes it sweet. If we are talking about skill, let’s talk about my great shoes as well. Fallingwater Cellardoor is the mother of all pumps in SL (imho). Before there were prim toes and stiletto heels, there was Shiny Things with Fallingwater’s shoes, patiently assembled from prim pieces. Now she has adopted sculpties in her work and she textures her shoes with the most evocative and perfectly rendered textures. Get close to these shoes and you see the stitching, the tiny scuffs from walking, the pretty little buckles. There is no reason to spend your money on anything less than these works of art. I really hate when people jump into group chat and say, “I’m bo-ored,” don’t you? How can you possibly be bored in SL? If you are, log off. Yet the coolness of bored seems to pervade some venues. I don’t get bored, especially when you can change your look every day. Today I have put on an assortment of pieces to equal the girl in black. First a new top from Nyte Caligari, who continues to put quality content into SL after all these years, never stopping, always improving. I love the asymmetrical nature of this top. Then we have this spangled skirt from Ivey Deschanel (who rocks the glitter in her textures). I pulled on opera gloves from Anemysk Karu for a touch of glamour and hooked in earrings from Linka Demina for a bit of fabulousness. Today I have put together an assortment of pieces to equal the girl in black. First a new top from Nyte Caligari, who continues to put quality content into SL after all these years, never stopping, always improving. I love the asymmetrical nature of this top. Then we have this spangled skirt from Ivey Deschanel (who rocks the glitter in her textures). I pulled on opera gloves from Anemysk Karu for a touch of glamour and hooked in earrings from Linka Demina for a bit of fabulousness. Then I pulled on these cyberfantastic boots from ono Zinner. The brilliant thing about this set are the animations in the soles and running up the backs of the zippers, and the great HUD for changing the colors of the details to whatever you like. The texture of the boots can be changed to four different styles (I am wearing black carbon here), and there are 10 available animations for the soles. How can you be bored when you can find fantasy boots like these? Sometimes you come into SL and think, what else is there to do for fun? Go dancing? Nah. Shop? Nah. Hanging out at Ahern? Nah. So once you have fed the breedable pets and chatted a bit in Hey Girlfriends and rezzed 21 cubes and deleted them in frustration, you now have something else to do. 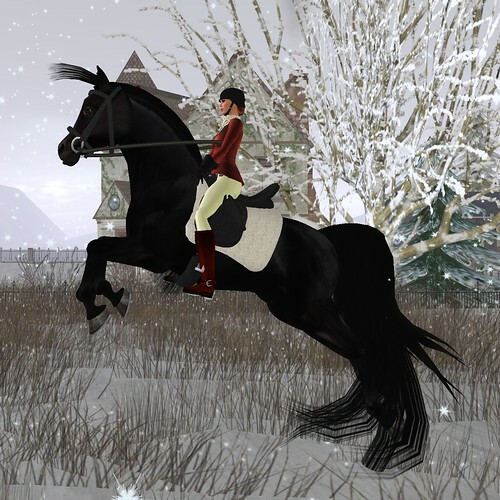 You can go horseback riding in SL in a way you have never experienced. 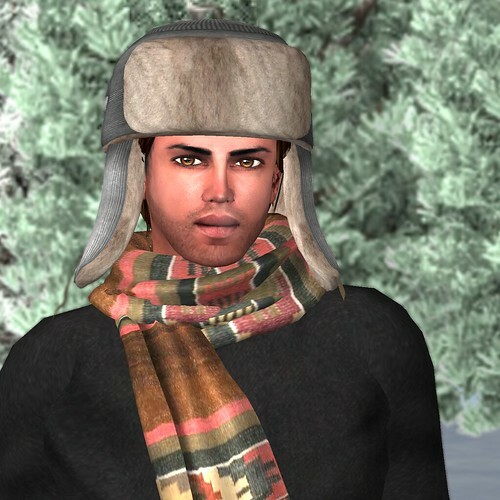 Finally in SL, you can meet horse avatars who would love to take you out for a spin around a beautiful snow-covered sim. Yes, I know what you’re thinking. Horse avatars? Is this some weird Zindra thing? Not at all. It’s simply people who enjoy being in the place an equestrian community would offer. They like dressing up their horse avatars, adorning them, and interacting with people as them. If you take a ride with a horse avatar, both avatars are engaged in something pastorally enjoyable. If you would like to participate in that kind of role play, even for an evening, you are welcome to join them at Carriage Trade. I went to Carriage Trade on the invitation of one of its owners, Shenlei Flasheart, and there I got the opportunity to meet Moon (moonsorrow.magic) and Rum Royale, who both allowed me to take a ride and learn more about the Carriage Trade sim. First things first, however. 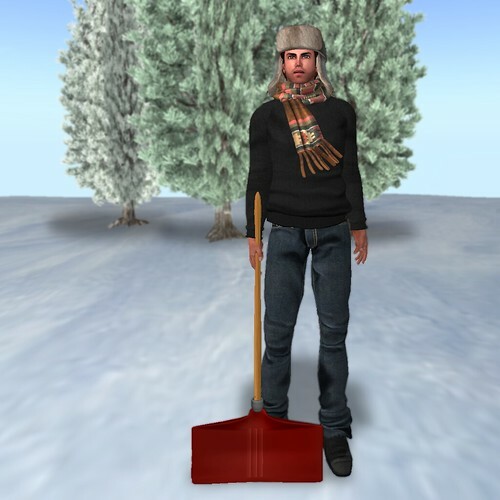 When you rez in, first make sure you hit the store, “In the Habit,” because they really want folks to dress in style for being on an equestrian sim (and as you know, I am not averse to engaging fashionably). I was able to outfit myself for riding in this beautiful jacket by Shenlei Flasheart over a lovely blouse (that can be worn alone and includes cap sleeves). The breeches give a perfect touch to the ensemble and the boots are de rigueur. These clothes would be perfect for horse breeders as well or just mixing and matching with other fashions. (Chances are you will see the jacket or breeches on me again.) Shenlei has been in SL for a long time, doing many fabulous things, and you will see her experience show in these pieces–well textured, well built and stylish. A ride around the sim is a relaxing and beautiful experience. Georgianna Blackburn and Shenlei Flasheart have both built the sim with snow-covered hills and Victorian houses, cobblestone paths and grazing cows–it’s a pastoral fantasy. Romantic carriage rides are also available if you can hook up with the horses or Shenlei. Plan ahead for a magical date with your special someone by making arrangements with some of the horses at the sim. I also met a woman who is planning her wedding with a beautiful carriage drawn by several of the horses, all adorned to the nines for the ceremony. I find it nearly impossible to sum up this experience. From meeting the sweet horses (who can be so accommodating and gentle and who really enjoy the whole experience of being groomed and enjoyed) to the beautiful surroundings to the absolutely amazing fashions (because you know, I really can’t enjoy doing something unless I have to dress up to do it), this is another new experience in SL you shouldn’t miss. Thank you to Moon, the beautiful and gentle horse in these photos. I had the distinct pleasure of being featured in an article in Avenue Magazine as a “Fashion Icon.” I was lucky enough to meet Rusch and Jesika, the owners of the magazine, face-to-face when I attended the SLCC both years. They are an amazing couple—warm, kind and whip-smart. I was flattered they thought enough that they had me do an interview for their publication. Then I got to meet the amazing Annough Lykin, who did photographs of me. See her great blog here. So it got me thinking about what I need to do sometimes to push myself a little harder. I have been taking on shadows and working around the hassles of that, and I share some images I did with you. 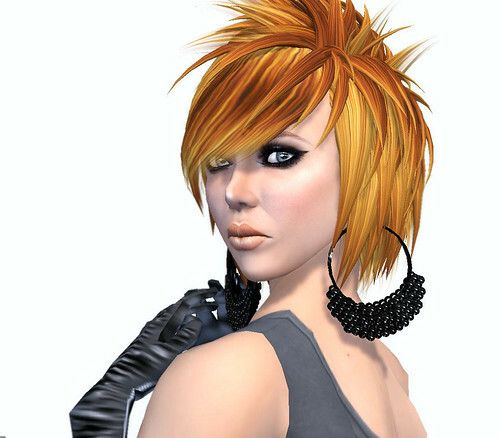 I am not sure I will do this frequently; my blog isn’t really about my pretty photos—it’s about the beautiful fashions in SL and sharing them with my readers. But let me indulge my vanity today. Of course, wearing a dress from Nicky Ree always makes me feel beautiful. I was discussing Nicky’s considerable talent with another designer the other night and we both agreed Nicky simply has some of the most beautiful texture work on the grid. 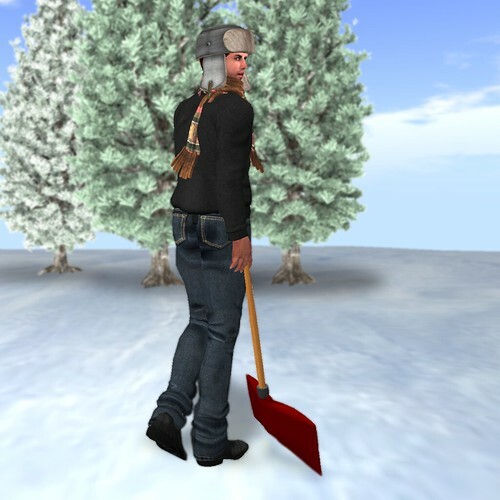 We also agreed she pushes the ingenuity with prims in SL. She works within the restrictions of SL and blooms. I adorn this look with earrings from Squinternet Larnia, of whom I don’t say a lot enough. I visited her store tonight and I was absolutely blown away by the quantity and quality of her content. (Yes, I know I need to blog more of her work.) Her jewelry is exquisite and quite different from lots that is available on the grid—much more “costume” and designer and dramatic than a lot, which I appreciate. Photographed at World’s End on the Heaven Lake sim. Green is my favorite color. It’s the color of the earth’s bounty, the color of the sea, the color of emeralds and even American money. You’ll see me in a lot of green generally—it suits a redhead. This beautiful dress from Sascha Frangilli is a perfect example. Elegant in silhouette and textures, it is ideal for formal occasions or dancing (and I took this one out for a whirl). Sascha offers this as part of a larger package, which includes her always versatile variety of skirt sizes and shapes and top pieces (including a ruffled shoulder piece and a stole). She also offers this gorgeous emerald in a cocktail dress that also includes several skirt and top styles. Sachi Vixen has come out with a new set of skins that is absolutely lovely. With a fresher look and subtler makeup, sachi is tapping into the desire we all have for a glowing look and a shapely body. She includes with her skins, as always, a variety of nail polishes, and this time, eyebrows and hair bases. Worn in v2.4 and above, you can pile on the layers. I am showing this in Phoenix, where I have once again tackled the shadows. I am getting there…. My brother, Peter, is an outdoorsman. He has a hard time being inside the house—says it makes him claustrophobic. You can generally find him outside puttering around, putting out salt licks for the deer or tinkering with the Gator (some ATV thing he’s gonna break his neck on) or chopping wood for Mom and Dad or checking his deer stand for the 20 millionth time. He’s a quiet guy but pretty restless. He says the air is clearer out there. The rest of us think winter stinks; he thinks it’s a fine opportunity to throw on a sweater and walk around outside. I managed to catch him out in the back field, going to shovel some path for the bunnies or something. He has on his new favorite sweater, one he got from mappy Handrick, which is a great turtleneck normally, but he is wearing a scarf he picked up from Jon Ree, hiding the neck. His jeans are from mappy Hendrick too; plain and versatile, they have a nice blue tone that isn’t all washed and wussy. Boots are his trusty worn Somas from Eponymous Trenchmouth.